Discussion in 'Introduce Yourself' started by Geordanne, Oct 14, 2018. - Do the back mounted Standards also buff the user and do their effects also stack with other players standards? - Add flamer and heavy flamer weapons for each faction. - Add heavy classes for each faction. - 'Jump Assault' should be 'Assault (jump pack)'. - 'Ground Assault' should be 'Assault'. - 'Storm Shield' should be 'Combat Shield'. - 'Blazing Rounds' should be 'Inferno Bolts'. - 'Blazing Pistol Rounds' should be 'Inferno Bolts (Bolt Pistol)'. - There should be click through text and image based tutorials at the Character Selection and Hub screens for features such as mêlée combat. - There should be information readily available at the Character Selection and Hub screens on the different maps and game types. - There should be a maximum total of at least 20 character slots to make space for characters from each of the 5 sub-factions of the 4 factions. - The faction characters in the Character Selection screen should be able to be arranged in any order once created. - The Character Selection screen should display a fraction showing how many characters created out of how many character slots total whilst also giving options for characted list displays e.g. 4 in a row, 2 rows of 4, text list etc. - There should be the option to select a loadout to display in the Hub and Character Selection screens. - Both the Options and Quit buttons should be available at the Hub screen. - The constantly flickering and shifting display screens in the Hub screen are very annoying and disruptive, please use less erratic graphics that do not distract the user. - The Select Loadout screen should show the equipment name when the mouse hovers over each icon. - The Wargear section in the Inventory menu should be seperated into Wargear 1, 2, Trinkets, Consumables and Grenades. - The game should remember the 'Order By' preference setting in the Inventory and Store screens between logins. - The World Map screen should have the map legend displayed by default and also show the name of each landmass and region etc. - The Waiting For Players screen should also show the map legend by default. - The Esc key game options (controls etc.) should be available in the Select Loadout and Waiting for Players screens in PvE game modes. - There should be everpresent indications of what map and gametype one is currently playing when in-game. - The in-game Select Loadout screen should show the loadout stats. - The three vehicle types in the map legend in-game map spawn location screen should instead say 'Transport Vehicle', 'Battle Tank Vehicle' and 'Siege Tank Vehicle'. - The loadouts should be able to be arranged in any order once created. - The Select/Edit Loadout screens should also show Armour, Stamina and Fuel Capacity/Regeneration stats. - The character model should show the back mounted Standard equipped at all times, not just in the Standard selection screen. - The advancements should show loadout points and slot for each piece of gear. - The advancements should show be in distinct categories for ease of comprehension. - The Assault (jump pack) and Ground Assault classes should be one class (Assault) with the option for jump packs and the fuel capacity/regeneration equipment worked in. - The advantage of Assault (Ground Assault) class is when vehicle transport is desired and also for cramped battlefield environments. - The Frag Bundle kill weapon notification should instead just show the Frag Grenade. - The score menu should be available whilst sprinting. - When a game is about to end a large 5 second countdown should appear on the screen so that players are not startled by the sudden cessation of gameplay. - The faction win indicator at the end of a game should not immediately flash on the players screen as it is annoying, after the game ends the screen should immediately shift to the commendations/rewards/score screen instead. - The name of the map should appear above the minimap. - There should be currently wielded weapon names and icons displayed near the ammunition counter. - The HUD should show numbers next to the armour and health displays. - There should be an indication on the HUD near the fire select indicator (semi/burst/auto) that shows whether or not the scope mode is currently active. - The leap/roll of the space marine should articulate into continued motion instead of pausing briefly before continuing movement. - The jump pack manoeuvres should not be anywhere near as quick and jerky when beginning a ground strike, changing direction etc. - The elevator pads should just move up and down, instead of whatever bizarre function they currently have. - The elevator side barricades in Tyranid Lair Mode are low enough to be able to climb over. - The mêlée combat feels quite clunky and techniques such as a Space Marine charging up a front kick seem silly and unrealistic. - The leaping strikes seem a bit overdone. - The explosive effect of the Jump Assault ground strike is silly and unrealistic. - The Frag Grenade explosion effect is too twinkly. - The surface fracturing from damage on power armour does not look realistic at all and is not the sort of effect that damage would cause, damage from physical impacts would likely cause armour chinks whilst directed energy energy weapons would vaporise and char. - A lot of the effects from the abilities of the medic/special classes are too graphically exaggerated and can cloud the screen and interfere with one's gameplay effectiveness. - The Combat Shield should be available to the Assault (jump pack) class as well and should show it attached to the forearm not just floating near it. - The Combat Shield should also allow the use of a sidearm with the same arm as the Combat Shield is fixed to the forearm and does not require it to be gripped, it is also not as large or heavy as the Storm Shield. - The vehicles should not flip up on obstacles as if they weigh almost nothing. - The circumference of the Space/Chaos Marine upper thigh armour is not high enough to be realistically proportioned. - The lower body of the Eldar models are too slim, the pelvis should be slightly wider on the male model and proportionately wider again on the female model. - The round bases that the character models stand on should be like those of the actual tabletop miniatures, based on the environment with the free default option being metal surface with other character bases being available for RTC. - Model the scopes and other attachments on to the weapons that can equip them. - The Plasma Gun grip mod does not show on the model when applied. 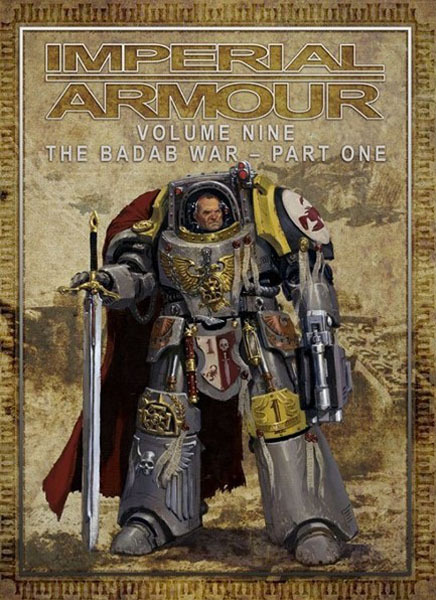 - The Abaddon's Grace autocannon should feature the creature skull on the barrel, not the bayonet. - The space marine in power armour moves about in a jerkily agile way when in close combat etc. that is not realistic at all. - The model should show the sidearm and mêlée weapon holstered/sheathed etc. when not wielded and the primary weapon should be slung/magnetically clamped etc. when the sidearm and mêlée weapon are wielded. - The textures of the Venerable weapons from the founders packs etc. should not show rusted, poorly maintained weapons, obviously boltguns etc. that are thousands of years old would be carefully maintained and touched up by the chapter's artificers and the textures should reflect that. - The Space Marine Combat Knife (Alt) icon does not correctly depict the weapons model. - Several of the Ork Appearance option icons for the Arms customisations do not correspond with the models textures and could also be named for descriptively. - The developers could have instead made a more rudimentary faction-theme aligned base for each of the four current factions instead of using an overblown imperial base that seems contextually out of place. - Coastal regions are likely for the location of primary garrisons for all factions. - Space Marines would probably set up base in a mountainous region for reasons of inaccesibility and altitude advantage. - Space Wolves would possibly opt for an artic or tundra region for reasons of affinity. - Chaos Space Marines would probably set up base in a volcanic region for reasons of additional passive defence and style. - The Alpha Legion and possibly also the Night Lords would likely opt for a more concealed location, perhaps cliffside or even subterranean. - Orks would probably set up base in a forest/marshland edge or cave region for reasons of affinity and possibly additional passive defence from the hazards of an extraterrestrial marshland environment. - Eldar would probably set up base in a forest region for reasons of stealth and affinity. - The fortress garrison would not be anywhere near as ornate/baroque as it is since they have presumably just made landfall on Arkhona, it should be much more rudimentary and militaristic. - The Tyranid gaunt spawning pool in the fortress is a ridiculous feature that would not be present at any base except maybe an Ork one. - The Tyranid corpses everywhere looks silly and is not a feature that would be present at an imperial stronghold, maybe a few at a Space Wolves or Orks base but nowhere else. - Just have shooting ranges with bullseye or Tyranid anatomical chart targets instead. - The Widowmaker Boltgun is modeled with a larger box magazine and so it should also have a higher magazine capacity. - The Chaos Space Marine in-game Select Loadout screen does not show the melee weapon for the Traitor class. - For the Swooping Hawks, a shimmering multicoloured actinic silhouette around the vibrating feather plate wings and a much shorter and less visible backpack jet trail is most correct. - Gaunts should not be able to climb vertical or ceiling surfaces. - The Normal Mode gaunts should move faster and be slightly less resilient and lethal. - The Normal Mode Tyranid warriors/Alpha should not be anywhere near as resilient as they are and should appear in groups of about three amongst the gaunt swarms. Thank you for reading over these game improvement suggestions and I hope that they are taken into consideration by Eternal Crusades developers and also inspire the player base to come forth with their own suggestions in a more ordered and comprehensive way. Sorry I haven't watched the last ETW livestream, where is the information regarding the dev team's status? Eternal Crusade did seem a tad cartoonish when I first saw it and I'm not sure if the Unreal engine was the best choice for a game that I think should have played more like a tactical shooter similar to the last few from the Rainbow Six franchise. This list is still mostly up-to-date. There are a small Swooping-Hawk-buff and a Banshee buff planned or already in the build, haven't checked. There are also probably a couple of things they have done since and not told anyone about. And, of course, the exquisite Blop-shoulderpads. Hello Lady Rheeva, I have access to the UAT build though I have found it is much more easy to find games using the regular build. I have also noticed that it requires a repeated 500 megabyte (roughly) download when switching between the 'NONE - Opt out of all beta programs' and 'uat-shipping - UAT shipping' in the Properties/Betas box, do you know why that is? The UAT-build doesn't really have active players. You can look at new stuff in the garrison- and loadout-menu though. From time to time there will be playtests, announced in the forums and on the UAT-discord. UAT is a different build of the game so you have to re-download every time. There is a workaround to this which is simply creating a second folder in the EC-directory, one with EC, the other with UAT-EC and simply switching renaming the one you aren't currently using. Thank you Lady Rheeva, that workaround will be quite helpful.